The Jim Dunlop Geezer Butler Cry Baby Wah Bass Guitar Effects Pedal, bears the name of a man whose uncompromising and unique approach to his tone, helped to change the musical landscape forever. As one quarter of rock 'n' pioneers, Black Sabbath, Geezer was the first bass player to record with a wah pedal on their self-titled first album. The rest as they say, is history. In creating their first signature Cry Baby Bass Wah, Jim Dunlop could think of no other bassist worthier of the honour. The iconic riffing of Iommi, the rolling drums of Ward, and the cutting vocals of Osbourne. It takes a lot to cut through that mix on stage or record, complementing them all whilst delivering something unique at the same time. Geezer Butler found a way, with a mighty low-end energy that rumbled along nicely. However, it was when he came to record the intro to N.I.B. that the band's producer suggested using a wah. The added layer of expression took Butler's playing to another dimension. In designing the pedal, Jim Dunlop took the aggression of the Cry Baby 95Q Wah, and doctored its sweep so that from the heel-down position, customised circuitry mixes in a perfect amount of dry signal. As you tilt towards the toe-down position, your dry signal is removed to allow the Wah's aggressive side to become more prolific. The internal Q control allows the frequency's bandpass shape to be adjusted to suit you, as it comes factory-set to Geezer's personal preference. Modelled on the pedal he uses on the road, the Geezer Butler Wah is voiced exactly to his specs, with the convenient auto-return switching enabled so that he can step in and out of the effect easily. 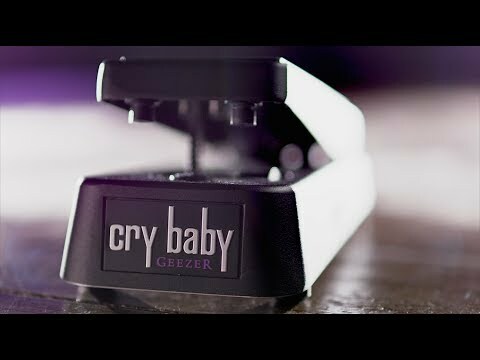 If you're looking to recreate some of rock's most enduring and iconic riffs and follow closely in your hero’s footsteps (literally), then it doesn't get any better than with the Jim Dunlop Geezer Butler Cry Baby Wah Bass Guitar Effects Pedal.